When I am stressed I count my fingers in pairs by tapping them against each other in a pattern from pinkie to thumb over and over and over again. I do it subtly, so no one sees, because I don't want them to know I am stressed .... or nervous... or worried. I sometimes do it when I am bored too. If I am alone and no one is watching I sometimes trace a pattern around my lips with my fingers. Usually doing these things helps calm me. It occupies my mind and gives me a soothing feeling. If they don't work I might start bouncing my legs a bit or get up and pace. All those things are stims. And I bet you stim too sometimes. 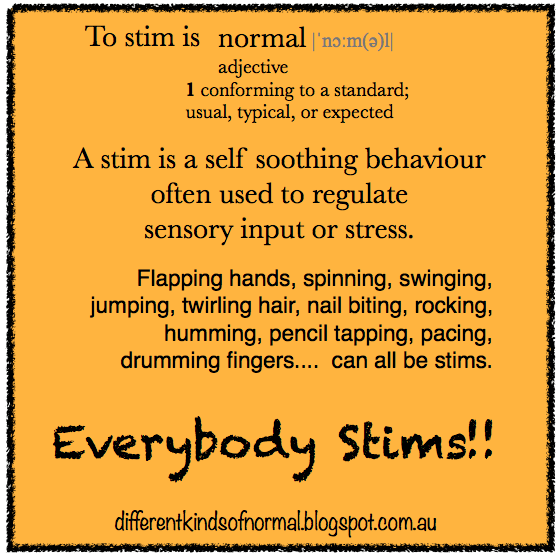 A lot of people assume that stimming is something only Autistic people do, but this is just not true. We might notice an Autistic persons unfiltered stimming more than we notice other peoples, but we all stim. "To stim is to engage in movement and/or in other activity that stimulates one or more of one's senses, for the purpose (whether intentional or purely instinctive) of regulating one's own sensorimotor experience and/or state of consciousness. Examples of stims include (but are certainly not limited to) such activities as rocking, hand movements, humming, drumming, touching a surface, or gazing at running water. Functions of stimming include (but are certainly not limited to) self-calming and self-soothing; inducing, enhancing, or responding to experiences of sensory pleasure; regulating sensory input; integration of information; and accessing specific capacities and/or states of consciousness." "It is a message that says that I have so much to express and cannot hold it all inside and I must show you right now. It is an all-encompassing feeling that touches every part of me, from the top of my head to the bottom of my feet. What it isn’t is shameful." "Stimming is almost always a symptom of autism, but it’s important to note that stimming is almost always a part of every human being’s behavior pattern. If you’ve ever tapped your pencil, bitten your nails, twirled your hair or paced, you’ve engaged in stimming. "The biggest differences between autistic and typical stimming are (1) the choice of stim and (2) the quantity of stim. While it’s at least moderately acceptable to bite one’s nails, for example, it’s absolutely unacceptable to wander around flapping one’s hands. "There’s really no good reason why flapping should be less acceptable than nail biting (it’s certainly more hygienic!). But in our world, the hand flappers receive negative attention while the nail biters are tolerated. "Like anyone else, people with autism stim to help themselves to manage anxiety, fear, anger, and other negative emotions. Like many people, people with autism may stim to help themselves handle overwhelming sensory input (too much noise, light, heat, etc.)." but rather how will we support them and encourage others to accept their stimming? To figure out the best way to help others accept stimming as normal, we need to look at what purpose it serves for our individual children. For me stimming is a stress release. For my MissG stimming is both a stress release and an expression of excitement. Watch your child and see what is happening when they are stimming. See if you can figure out what is going on for them. If they can talk ask them to tell you!! Then tell your childs teachers and therapists/ your relatives/ your friends/ whoever-is-saying-your-child-shouldn't-stim that stimming serves a purpose and that you do not want them to tell your child to stop! And don't forget to point out that everyone does it! As our children grow older they might notice other peoples reactions to their noticeable stimming. This has happened recently for my boy, and so we discussed his options. He decided to try for a quieter stim at school, and to do his noisy vocal stims only at home if possible. He decided this because he noticed he felt more stressed when people looked at him and so the stim wasn't "worth it" in that context. We talked about other things he could do that were more subtle and he chose a few alternatives to try. I'm cool with that for the most part. I do think it's sad that he had to consider these things, but he was ready to, and the decision to change what he was doing was all his. And that is how it should be. Our children should have control over the decisions about their body and how they behave. If they want to stim, they should stim- however they want to. There should never be any question about stopping a stim because it is "socially inappropriate" or "makes others uncomfortable". Cynthia from "Musings of an Aspie" has written some very helpful things about this, which I'm going to quote because 1. she's Autistic and her voice is more important than mine on this topic and 2. she says it so well!! and 3. If you need to talk to teachers/therapists or relatives/friends about stimming Cynthia is an excellent person to quote. "Oh, wait, I know: socially inappropriate stims are ones that draw attention to us. If you rock in public, people will stare. And whose problem is that? If you sign in public, people will stare. If you use your wheelchair in public, people will stare. If you limp in public, people will stare. If you use your assistance dog in public, people will stare. And if people do stare, other people will think they’re rude. Who would tell a Deaf person not to sign in public or a paraplegic not to use their wheelchair in public? But people tell autistic kids not to stim in public all the time. Again and again I see conversations and articles insisting that stimming–or if they’re trying to be politically correct, certain types of stimming– isn’t appropriate public behavior. Really? And why is that? Who exactly does stimming embarrass? Not the autistic person who’s doing it. (emphasis mine)"
"There is another argument against stimming at school or in other public places: we need to teach autistic kids socially acceptable behavior so other kids/people don’t think they’re weird. Well, I have two things to say about that. "Yes, autistic children should be taught the same social rules as typical children. They should be taught to respect others and all of the rules of politeness and civility that go along with it. But here’s the thing: I was an autistic kid and I can tell you for certain, stimming or not, the other kids already think we’re weird. "Instead of insisting that autistic children adopt unnatural behaviors for the sake of social acceptance, how about working toward changing what is socially acceptable?" This blog post is part of the Flashblog presented by #BoycottAutismSpeaks as part of their #posAutive campaign. Details can be found here. Early on in our relationship my Wonderful Hubby and I agreed that we wanted to have a large family. Our first pregnancy was unplanned, but our daughter was certainly not unwanted. We were young and brave and a little bit naive as we began our journey into parenting. It was a rocky start. We had some tough times. After 3 years together, we spent some time re-evaluating our priorities and determining our intentions. We decided we wanted to have 6 children, and that we were committed to making sure that as our family grew we would structure our careers, our volunteer activities, our lives so that one of use would always be available to be the primary carer for our children. Our daughter by 3 years old had grown to be an energetic and creative soul, who seemed to struggle with anxiety but had such a determined spirit and shared her fathers great sense of humour. We added number 2- a quirky little guy with a winning smile and a happy disposition who hardly spoke and seemed to struggle with sensory input. Number 3 arrived a non-sleeper who loved intensely and had compassion for others like I've never seen in a toddler. We were tired, and busy, and still young- so we decided to stop a while and see how we felt about more kids in a few years. Around this time we learned about Autism through a friends journey and became pretty sure that MasterL was Autistic, but fear of what that label would cost him in society led us to put off seeking a diagnosis. Then there was another unexpected pregnancy. This one ended at 12 weeks with the loss of our little one and the realisation that we had unquestioningly wanted this little life to join our family, even though we were not planning for it. So we began again in our intentional quest for that large family. Number 4 arrived- a sweet little girl who adored her Daddy, her family and life in general. It was around this time that Hubby began to noticeably struggle with his mood. We were separated for a few months during this year. I struggled with my fear that him returning to live with the kids and I would be too hard, but love won, and we have not looked back since the time we made our second conscious decision to partner with each other . Number 5 arrived. 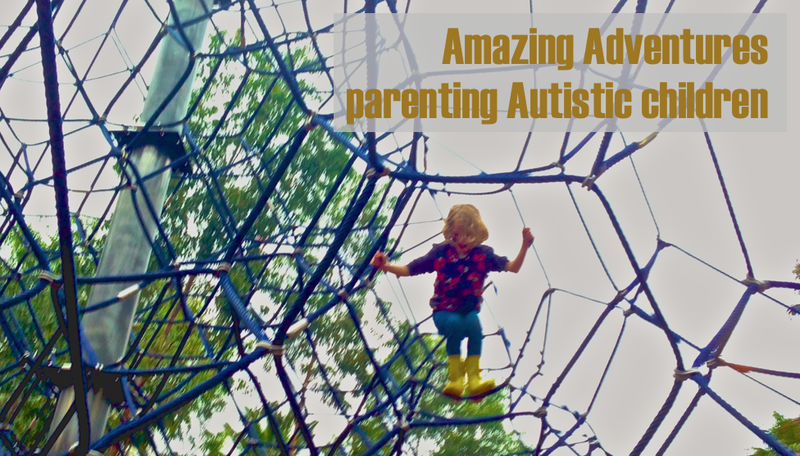 A bright and active little girl who so desperately wanted to get into everything, had no sense of danger and experienced significant sensory challenges from the day she was born. So we paused again to evaluate. Could we support our girl sufficiently if we were also caring for another new baby? Did we have the resources to provide what she and our other children needed if we had a 6th child arriving? The answer was no. MissG, as you regular readers know her, needed my full attention. She needed me to be available to help her navigate the difficult world she was facing. We decided to wait again and see what the next few years brought us. In the 5 years after MissG joined our family MasterL was diagnosed Autistic, Wonderful Hubby was diagnosed Bipolar, MissG herself was diagnosed Autistic and at 17 years old E was diagnosed Biploar. People said how hard our lives were. People said how brave I was. How strong I was. I felt sorry for myself sometimes. I struggled to overcome the feeling of overwhelm I experienced. I felt anything but brave and strong. I made the mistake of listening to the mainstream discourse that said my life was difficult and my children were hard and my family was just going to be a statistical casualty in which my Autistic children would grow up to be less-productive-less-happy-less-than than others and my Bipolar family members would not be able to work and would end up committing suicide. I listened to fear. I felt fear. And for a short while I cultivated fear. I let the "what ifs" rule my life. What if I can't cope? What if others in the family can't cope? What will people think of me having another baby knowing the chances are that child will have a disability? What if a new baby is disabled? I battled my desire to have the 6th child I so wanted. And then I stopped. Mostly because I was too tired to keep the battling up. Fear was making me tired. Fear was making me stressed. Fear was causing me to worry about things that hadn't happened. Fear was making me my own enemy. I realised that the diagnoses my family members had received were a gift that gave us power. To know who you are is powerful and empowering. To find your tribe is strengthening. To learn what supports you need to succeed is life changing. I realised I had been given the key to being what my family needed. The information about who they are is a precious thing. It gives me the knowledge I need to go and find out how best to help my family. I realised I have the ability to choose fear or love. With choosing love comes choosing acceptance. With choosing acceptance comes peace. Peace in my heart. Peace in my mind. Peace in the core of my being. I would not change a thing about my life. I would not change a thing about my family. Oh, there is a lot I would change about the world. But my family is fine just the way it is. So in the end the choice to fall pregnant again was an easy one. All it involved was love. Could I love another child? Absolutley. Could the rest of the family love another child? Without a doubt. 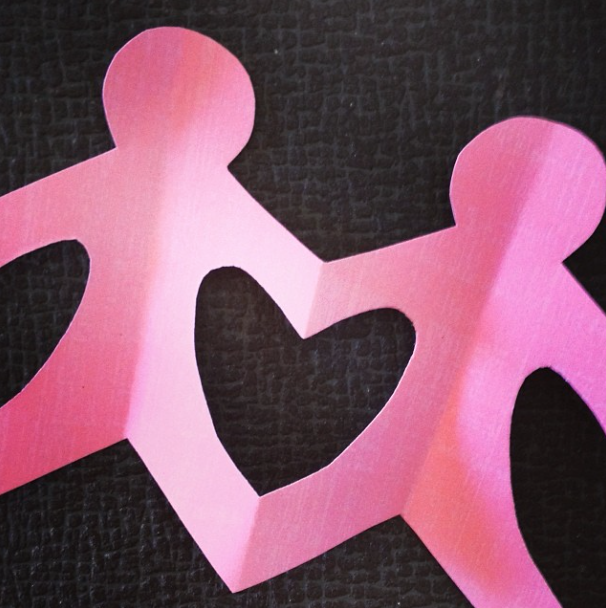 Could I provide support to another child, no matter what that childs support needs were? Yes, and I was, and remain, completely willing to do that for all my children no matter the cost to me. So Number 6 arrived. A boy. My first Caesaren after 5 natural births! Our biggest baby born at 4.5 kgs (9.9 pounds). A snuggler. A smiler. A joy to us all. All the older children adore him. He adores them. On his first birthday I was shown a blog I'd not seen before, and I read this. "..........Autism isn't something that happened to me. parent, knowing that my child's future was out of my control. I may not have understood that then, but I do now." I immediately read it out loud to my Wonderful Hubby, and I bookmarked the blog and copied the quote into this blog post. Because I get what she is saying, and it is true for me too. There was a point in my life at which if you had told me I would have a Biploar husband and daughter and Autistic children I would have intentionally chosen a different path. Because I didn't know any better. And at that point fear would have robbed me of the wonderful life I have now. At that point I had an idea in my mind of what marriage, relationships, parenting would be like. I know now that no matter who I chose as my life partner and no matter who my children turned out to be that idea was wrong. None of us can predict what our lives will be like. None of us know when we choose to have children who those children will be and what will happen in their lives. It is a risk every single time. My first 5 children were born before we officially knew the names of the challenges our family would have. My 6th child was born when we did know. As it turns out, the decision to have him in our family was just as easy as all the others. Because we made it from a place of love not fear. Did you know that in the past few weeks in America three Autistic people have been murdered by their parents? Their names are Randle, Damien and Vincent. The news reports about their deaths consistently focus on the fact that they were Autistic and bemoan the plight of the killers. They make statements like *difficult to care for*, *parents exhausted and struggling to find services* and *this was an act of love*. This is not excusable because their parents found caring for them hard. This is not understandable because their parents needed more support. Violently ending your sons life is not an act of love. This is not OK in any way. Randle, Damien and Vincent were human beings with rights who were murdered by the people they trusted to protect them. We must stop referring to Autism as a disorder separate from the person. We must stop calling Autism a tragedy that steals children away from their parents and ruins whole families lives. We must stop sympathising with murderers. We must start calling out those who do. Autism is a neurological divergence that exists within the wide range of what is normal for humans. Autistic people have the same rights as all other people. As Amy Sequenzia says, "Autism rights are human rights".